These arrived today. Yes! 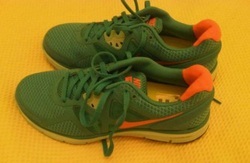 My New Nike LunarGlide 3s. I ran 12 miles in my old LunarGlide 2s on Sunday and am worried they are so dead that I have a shin splint…so these have come in on time, but will I be able to run a half marathon in them on Sunday? All will be discovered tomorrow morning on my little practise run. It’s ridiculous but runners are SO fussy about their shoes, and secondly about their legs. The slightest little niggle and I start worrying about shin splints, and worse. Of course the truth is that Mr Millard is the one who really suffered and had to have one of his hips RESURFACED with metal last year, thanks to overdoing it on the old Marathon track. Talking of which….here are some pics of the Great Wall of China Marathon, taken by Julie Sparrow, who has done it and lived to tell the tale. Actually she’s going to be giving me a masterclass. This picture is showing the steep route and also the fact we will be running in something of a wilderness…yes this is what we will be going up after 20 miles.. .not quite the centre of London, is it…well, its a challenge! Roll on May 19th!